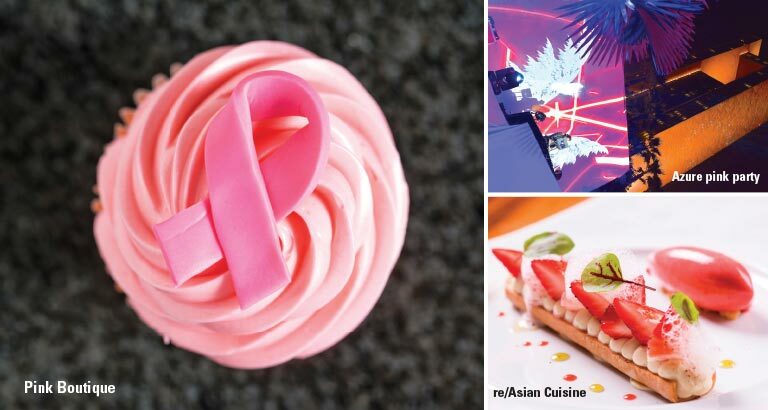 This leading five-star property is going all out to promote Breast Cancer Awareness Month. Always a big supporter of charities, whether local or international, Four Seasons Hotel Bahrain Bay is going pink across all its outlets to raise cash and awareness for Think Pink Bahrain. The Four Seasons Pink Boutique, in a specially prepared alcove in the lobby, will be offering delicacies prepared in the hotel’s kitchens along with pink macaroons and roses daily from 11am to 9pm. Bahrain Bay Kitchen will offer a Pink Brunch throughout October with an extra BD2 appearing per person on the bill going to Bahrain Breast Cancer Society – prices for this are BD25++ with soft drinks and BD35++ with selected beverages. At Bay View Lounge there’ll be a daily Pink High Tea With a View, from 3pm to 9pm. It comprises the usual delectable sandwich, cake and tea offering with an extra BD1 on the bill going to charity. The price is BD15++ for one person or BD28++ for two. In one of the month’s big highlights, Azure pool lounge hosts the Azure Pink Party on October 27, from 9pm to 2am. Always a select affair, these Four Seasons parties introduce great music and a fun atmosphere and, this time, all profits will be going to Think Pink Bahrain. Tickets are BD50 including two drinks. Book a table for six, with a bottle of premium beverage for BD400, or a table for eight, with two bottles, for BD700. Throughout the month guests visiting the pool will be able to enjoy a special pink mocktail at BD4, of which 500 fils goes to Think Pink. The hotel’s famed Wolfgang Puck outlets are also getting in on the act. The popular Blue Moon Lounge, on the 50th floor, and CUT Bar & Lounge will be offering the special cocktail Forbidden Kiss or Crackling Rosie mocktail with BD1 from each sale going to Think Pink Bahrain. Pastry chef Pierre Chambon will prepare a special pink dessert for each customer at both CUT and re/ Asian by Wolfgang Puck and the Asian eatery will also host a very special dinner on October 11 featuring a five-course menu paired with high-class, premium bubbly. Priced at BD59 per person, this event will see BD2 per ticket going to Think Pink. The Spa, too, will be offering a range of specials throughout the month, with BD2 from each Chakra Essence Ritual and BD1 for every Chakra Massage Collection treatment or traditional massage being handed over to charity. Chakra Essence Rituals cost BD115 for 120 minutes and include Earth, Air, Fire, Water, Consciousness, Spa and Soul essences. The Chakra Massage Collection, at BD80 for 75 minutes, features Serenity, Peaceful, Vitality and Awakening massages. And the traditional massage selection comprises De-stress, Energise and Tone treatments. The Spa will also be hosting talks by Think Pink founder Julie Sprakel to help increase guest awareness. So, if you’re looking for a chance to do some good at the same time as treating yourself with either great food, good vibes or a luxurious pampering session, Four Seasons Hotel Bahrain Bay is the place to be during October.